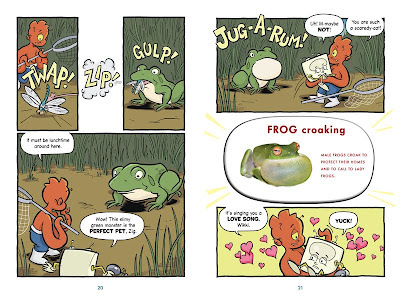 If you read my review from last year of the initial releases from TOON BOOKS, the unique beginning reader books in comic book format, you know I was an instant fan. 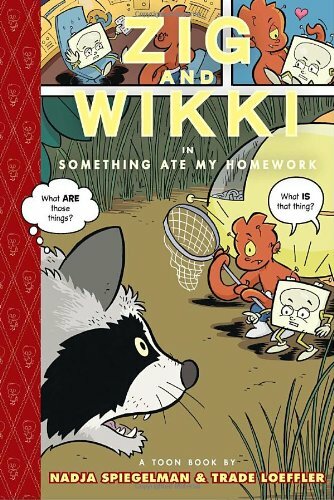 Their newest release, Zig and Wikki in Something Ate My Homework, does not disappoint. 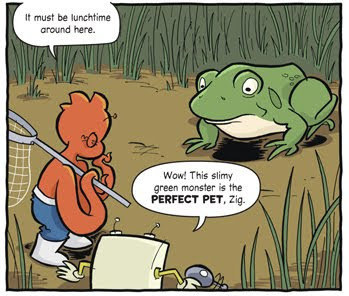 Zig and Wikki is written by recent college graduate Nadja Spiegelman and veteran cartoonist Trade Loeffler, the creator of the amazing online comic strips featuring Zip and Lil' Bit. 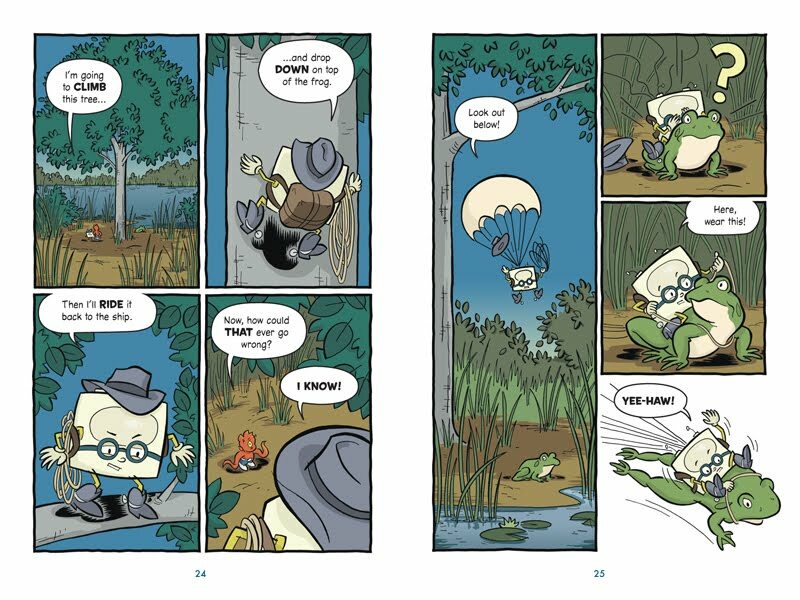 These strips, which can be up to 62 web pages long, include Upside Down Me, Sky Kayak and Captain's Quest. Zig and Wikki represents yet another brilliant first for TOON Books : a beginning reader book with science facts woven into "every twist of the exciting plot," as the blurb on the back of the book notes. When my brother Dash was little, all he brought home from the library were photo books about guinea pigs and sea turtles and I often found myself jealous of how many cool things he knew. I wanted to write a story that would have both hugs and bugs— a friendship and gross facts about flies. As the parent of a son who was exactly the same way, I appreciate and greatly welcome this perspective! The lines between fiction and non-fiction are especially rigid in the realm of beginning readers, perhaps for no reason better than a lack of vision on the part of publishers.Once again, thankfully, TOON Books brings that vision, along with quality story telling, artwork and overall packaging, to the frequently bland world of beginning reader books. The characters Zig and Wikki are wonderful. Zig is some kind of alien with his own spaceship and responsibility issues. Wikki, his best friend and partner in delinquency, is a computer-being who's screen pops on and displays pertinent facts throughout their adventure. And what an adventure it is! On the way to visit his grandmother, Zig's teacher rings in to remind Zig that his homework is LATE AGAIN! He needs to find a pet for the class zoo and fast. No worries, Zig can pick up a puffle pup at his grandma's. Except, the two don't end up at grandma's, they end up on EARTH! A few inches tall and armed only with a shrink ray and a net, the Zig and Wikki set off to find a pet. They first encounter a fly, for which Wikki provides some icky facts that will surely delight kids. After failing to catch the fly, the two aliens move up the food chain in their hunt, always with more factoids from Wikki, and almost becoming part of the food chain themselves! Shaken and shrunken (in Wikki's case, anyway) the two return to the ship empty handed. But, as their ship heads home, they discover a stowaway who will save the day! 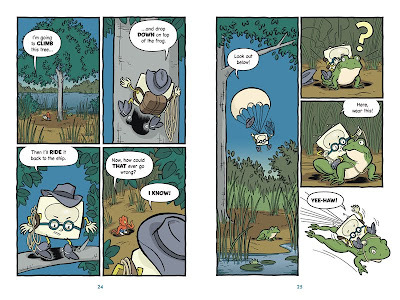 About further adventures for Zig and Wikki, Spiegelman says, "There are a few possibilities that I’m working through. I’d love to have them go under the sea because sea creatures are crazy weird. But I’d also like to try something completely different, and have them explore the physics of other dimensions. I’m still in the research phase right now." This book, I will definitely be waiting in line for, whether my non-reader is beyond it by the time it hits the shelves or not!